We know you’ve been there, sitting in your kitchen, clutching your warm, morning cup of coffee while your eyes heavily wander around the room noticing all of the little nook and crannies. There are crumbs gathering between the counter and the sink; the cabinets are dull and outdated; the junk drawer that refuses to open all the way; you have to blindly feel your way through the dreaded, deep, dark corner cabinet in hopes of finding for the right pot; and we mustn’t forget the “not so convenient” over the fridge cabinet, made for six-foot Sally on a good day. If you’re living in a kitchen you just aren’t happy with, you have two options: you could reface it with a new coat of paint or you could replace it. 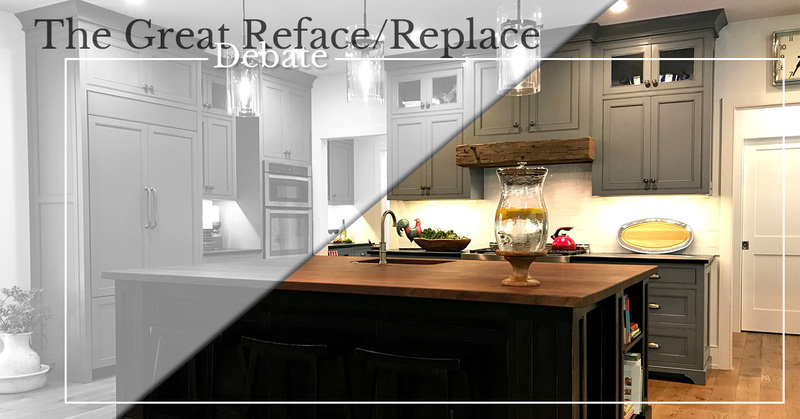 Let’s face it, determining the winner of The Great Reface/Replace Debate is a big undertaking. But luckily, you have the team at River Woodcraft on your side. We’ll break it down for you here with four easy questions to help with your next tough kitchen debate. New Homeowner: If re-doing the kitchen “someday,” then painting cabinets at this point is a very short-term investment that may have you end up spending more money in the long run, because, ultimately, another “face-lift” will be needed in the future. If you have the funds no, why not go for the full remodel and replace? Get the biggest bang for your buck. 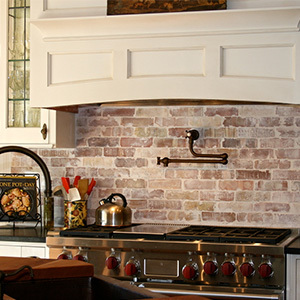 Open your kitchen up to entertaining with the most classic, high-quality cabinetry you can find, so you don’t end up with trends leaving you dreading another redo in the near future. If the funds are not available at the moment, hold off, resist the urge to paint and save. Instead, embrace some design tricks of the trade. De-clutter your space; use complimentary color tones in your accessories to play off colors you inherited instead of fighting against them. Middle of the Road (most common debate time): Staying at least another eight years in your home? Your cabinets now reveal a history of wear and tear from years prior, including dog scratches, dents from kids’ toys, an old leak from under the sink, etc. Or maybe you’re simply unhappy with your kitchen because it never functioned properly when you were entertaining. Replace it! Painting means your kitchen will most likely be super outdated by the time you sell, and the non-investment you made that is painting will be evident when you are trying to sell at a decent asking price. Heck, I’m Ready to Sell! : Selling in under five years? Go ahead; you have our permission — paint your cabinets! It’ll give your kitchen (and you) a good pick-me-up. Keep in mind, that “just painting” may be a less expensive alternative, however, it is still very labor intensive and can be just as invasive. If no, consider replacing it. 3. Do your kitchen drawers and cabinets function as they should? Do they provide adequate storage solutions for your needs? If no, consider replacing them. 4. Is the inside of your cabinetry coming apart? Is there water damage under the sink? Is the particle board crumbling or the lamination starting to peal? If yes, consider replacing it. At River Woodcraft, we want to help you make an educated decision based off our years of professional experience in custom woodworking in Doylestown, and we stand by the questions above when helping our customers with their debate. For more information and help on your “Great Debate,” feel free to contact us at: 267-247-5123 or email: info@RiverWoodcraft.com. We look forward to hearing from you!